The Stone of Twelve Angles. The Incas' engineering medium was stone. They didn't need to use mortar to hold the walls in place. Instead, they used precise geometry to cut the stones and create tight joints. The twelve corner-angles fit perfectly all surrounding blocks. 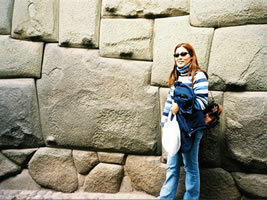 The stones were positioned without the use of mortar and have withstood centuries and earthquakes. Cuzco (Cusco) is located at 11,200 ft. above sea level in the Andes Mountains in Southern Peru. The Stone of twelve angles Puzzle: 22 pieces polygons.